Nottinghamshire serves as an administrative, geographic and historic county within the East Midlands of England. There is sufficient evidence of prehistoric settlements and Roman settlers presided mainly within the low lying regions of the east. During the 5th century the county formed part of the Kingdom of Mercia. Following the Danish invasion during the 9th century, the county formed part of the five Danish boroughs. One of the top holiday destinations in the UK, the county is famed for a wealth of attractions ranging from the Sherwood Forest to sublime art galleries. Take a stroll among the biggest antique fair in Europe, follow in the footsteps of poet Lord Byron or marvel at the 12th century Minster and its medieval carvings! Simply create a profile and scroll through our extensive list of van lenders across the UK. If you're looking for a Nottinghamshire campervan hire, simply scroll and select a van from the list below. It's that easy! Once you decide on a van, log in to chat with the van owner about reservations, van facilities and more! I am ColinT2, hire me today! Colin was born Cristiano the Campervan in 2005 in Natal on the North Eastern coast of Brazil. For a few years he played on the Via Costeira, liking nothing more than the feeling of freedom and adventure that travelling the open road brings. When he packed his bags and turned his back on his native Brazil, he headed East to a UK metropolis known as Bristol, where he was renamed Colin. Now he loves nothing more than the feel of the wind under his tyres, sitting around a camp fire, stargazing, laughter, good food and the gentle strumming of guitars. By day, Colin can seat up to five passengers. At night, he can sleep 2 adults downstairs and 2 small children upstairs (or another adult). He comes complete with a retro-style drive-away awning to increase his living and sleeping space and everything you need for a trip away, even a bike rack - all you need to provide is your bedding, food and of course, a chilled bottle or two. Hire Snowgirl our wedding bus to make your wedding day a fantastic Day. Chauffeur driven and decorated in your choice of ribbon to tie in with your colour scheme. Champagne or your choice of post church refreshment inclusive. Our Camper is a T5 highline which seats 5, sleeps 4 adults, has a poptop roof, sink and gas hob combo, fridge and awning. Is a lovely smart van to hire out for adventure and fun holidays. Hire our camper Hector! He's our lovely new conversion. Drop us a line on Camperbug for more details. Mr Toad was born in the summer of 68 in Newcastle upon Tyne. He enjoyed family life for many years before the children grew up, turning their backs on him in favour of cheap beer and Club 18-30 holidays. 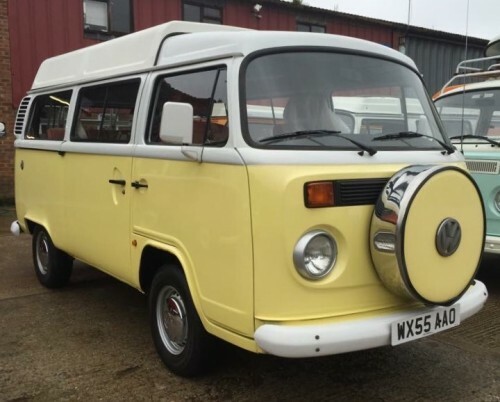 Aurora Campers Volkswagen Camper conversions and Hire of T5 and T6 campervans.